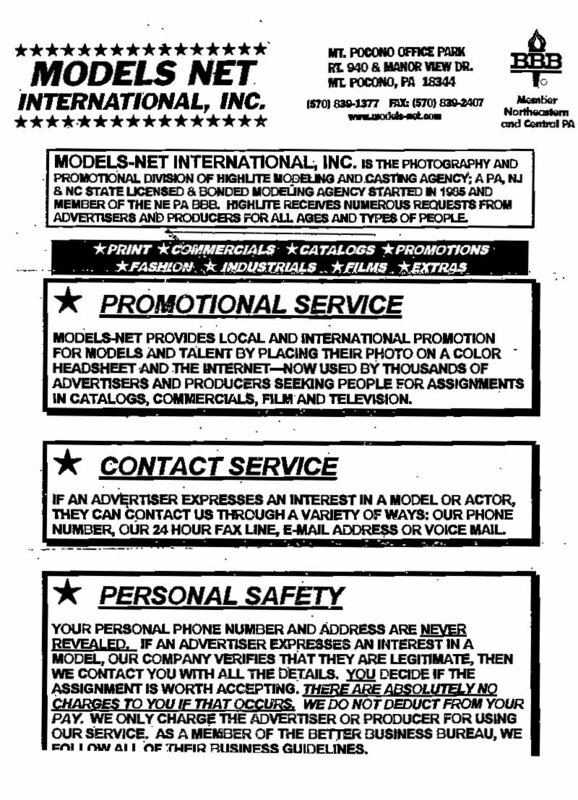 "Highlite Modeling voluntarily wishes to inform consumers that the probability of obtaining a modeling assignment through their promotional service is small." Translation: We'll take your money but won't make you money. This page contains important information to read in considering payment to Highlite Modeling Agency for photography and prints. There are scans of Highlite flyers and their application form as well as a letter from concerned parents, and information from the BBB, followed by a few comments. PLEASE INFORM US ABOUT HIGHLITE MODELING. WE RECENTLY WENT TO A MODEL SEARCH IN MIDDLETOWN, NY. THEY TOLD US TO CALL BACK THE NEXT DAY TO SEE IF OUR 7-YEAR-OLD MADE THE LIST AND OF COURSE HE DID. WHICH MADE ME THINK, "DOES ANYBODY GET TURNED DOWN? OR DO THEY MAKE THEIR MONEY FROM THEIR FEES FROM PICTURES? $249 PLUS TAX." PLEASE CAN YOU GET BACK TO US BEFORE WE SPEND THE MONEY ON SOMETHING THAT WILL DISCOURAGE OUR SON FROM BEING WHO HE WANTS TO BE. The concern about this company is they promote themselves as a BBB-endorsed company, use the BBB logo on their documents (see above), yet do not disclose in writing their disclaimer in the BBB record, which most consumers will not read prior to payment, and consumers also report they do not disclose their EXTREME FAILURE RATE in oral presentations. Given the statement Highlite itself makes to the BBB, it is perfectly clear, for all intents and purposes, this so-called "agency" is a travelling photo studio, not an agency. They make virtually all if not all their money from pictures. If nobody works, they don't make any money from commissions; therefore, ALL their only income is from pictures! 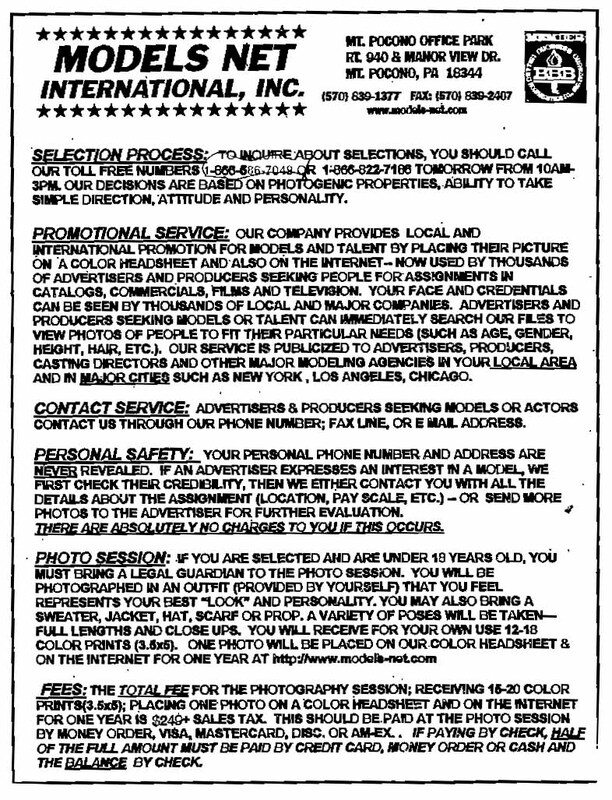 The president of Highlite was contacted by email more than once to elaborate on the BBB file, asked exactly how small the number of people who actually get work after paying for photos is. He refused to reply. Consumers who have paid or who are considering payment to Highlite are therefore advised to demand this information from Jerry Sangiuliano, the principal of Highlite. Any disclaimer Highlite makes that there is no guarantee consumers who sign Highlite contracts will get work is totally insufficient if it does not include their EXTREME FAILURE RATE. Given the fact they do have an EXTREME FAILURE RATE, why is this company in business? If all they are competent to do is take pictures, and they do not get anyone any work, why did they bother to get an employment agency license? The BBB says: "Highlite Modeling is licensed by the Commonwealth of Pennsylvania as an employment agency." The fact that the BBB of Scranton, PA, allows this company BBB membership when they know consumers are going to get nothing out of it, despite paying the company, is, quite frankly, disgusting. I am interested getting information on the this company. I need this information as soon as possible, my niece has an appointment tonight. Maybe it's too late to get it, but hopefully I can get it by 3:00 p.m. today. Promotional Division of Highlite Modeling and Castin Agency; A P?A, NJ & NC State Licensed and Bonded Modeling Agency started in 1985 and member of the NE PA BB. Highlite receives numerous requests from advertisers and producers for all ages and types of people. Models-Net provides local and international promotions for models and talent by placing their photo on a colot headsheet and the internet -now used by thousands of advertisers and producers seeking people for assignments in catalogs, commercials, films and television. If you are selected and are under 18 years old, you must bring a legal guardian to the photo session. You will be photographed in one outfit provided by yourself that you feel rpresents your best "Look" and Personality. You may also bring a sweater, jacket, hat scarf, prop,etc. A variety of poses will be taken- full lengths and close-ups. You will be placed on our color headsheet & on the internet for one year at http://www.models-ne.com. Fees: The total ffee for the photogrraphy session; receiving 6-8 reouched 5x7 color prints (different poses); palcing one photo on a color headsheet and on the internet for one year is $249.00 + sales tax. This should be paid at the photo session by money order, visa, mastercard, disc. or am-ex. If paying by check half of the full amoutny must be paid by credit card money order or cash and the balance by check. Your personal phone number and address are never revealed. If an advertiser expresses an interest in a model, our company verifies that they re legitimate, then we contact you with all the details. You decide if the assignment is workth accepting. There are absolutely no charges to you if that occurs. We do not deduct from your pay. We only charge the advertiser. (Above) This little girl's grandmother brought her to the Models Net International meeting, hoping they'll make it as stars. "I've always been interested in modeling, so I just stopped through to check it out," said Erica Gilliam. Jennifer Robbins, which Carolina Winds Production says, "If you don't have to audition and they accept everyone, that's also another clue to watch out for." Folks trying out for Models Net International are told if they are accepted, they'll just need a commercial headshot like the ones pictured above. Many people dream big of being a star, so why no let their dreams come true and jump on opportunities like traveling modeling agencies who are looking for talent, just like you? Sometimes it's the high hopes of stardom that makes it easy for talent agencies to pursue schemes instead of dreams. Peggy Parker brought her two grandchildren to the Models Net International meeting, hoping they'll make it as stars. "I brought them because I think my granddaughter is beautiful and my grandson is handsome," says Peggy. Erica Gilliam is an aspiring model and says, "I've always been interested in modeling, so I just stopped through to check it out." A simple audition on tape could land Erica a modeling job, but Better Business Bureau President, Kathy Barrett, warns careers don't happen overnight. "There's always someone looking to make money off someone else and you have to be careful. A lot of times, they promise high salaries, they'll have flattery and sweet talk to get you to abandon your common sense." So, keeping a level head when stars are in your eyes is key, especially if anyone asks for money upfront. Another warning sign is when the company welcomes you aboard before checking out your talents. Folks trying out for Models Net International are told if they are accepted, they'll just need a commercial headshot. That professional photo comes at a price of about $250, taken by their agency's photographer. But, what exactly do those photos get you? 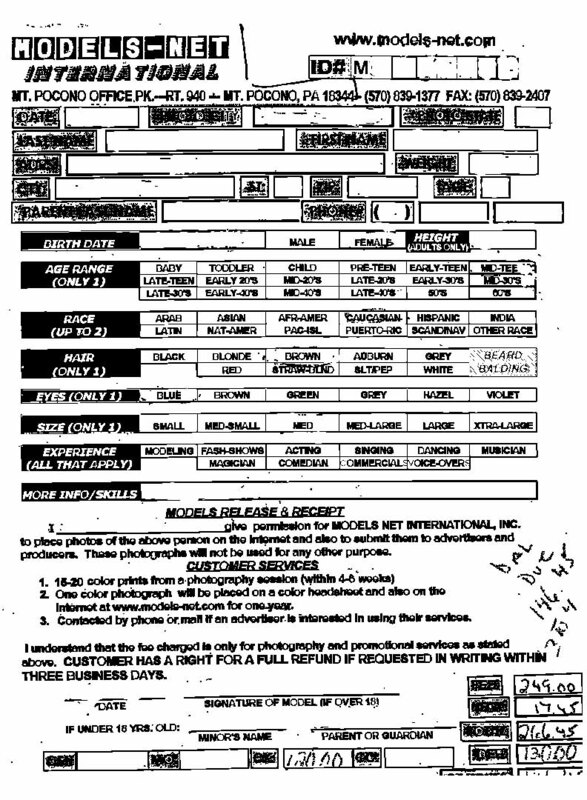 Models Net International Public Relations spokeswoman, Denise Karpowicz says, "They'll go on a laminated head sheet. [It shows a group of headshots] according to age group, similar features such as hair, eye color, skin tone, so on and so forth, they'll also go on our website." Still, no job is guaranteed. So Kathy Barrett suggests, "Always go with a level head and be realistic of what your expectations are." 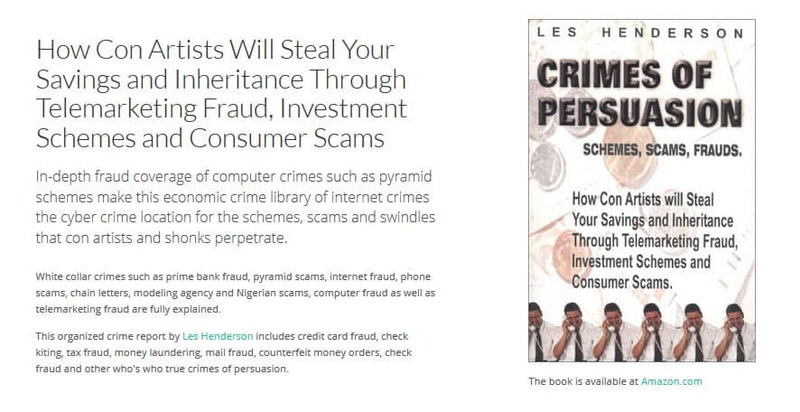 And by doing a little homework, you could prevent yourself from being lured into a scheme. "Checking the company out before you invest is the key, if you check first, then you have knowledge to make your decision," says Kathy. Remember, while talent agencies may have all their licensing and sound legitimate, they don't guarantee jobs. Just as this talent industry is growing, it is just as competitive as it is appealing.